Eight installations by international artists at annual public art event. “North,” by studioPERCH in Montreal, features 41 fir trees suspended in mid-air. Southern California had its own imaginary sea dragon-shaped lifeguard station. Miami is known for its coloured Art Deco beach towers. 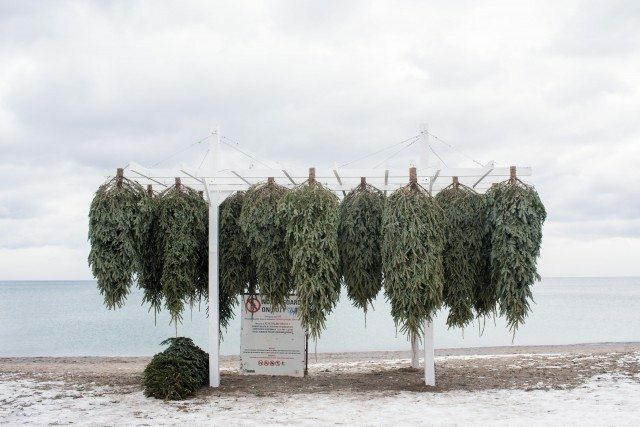 Not to be outdone, Toronto’s beaches are hosting a temporary collection of whimsical lifeguard stands that pull inspiration from its surroundings and the natural environment. Winter Stations, an outdoor exhibit of installations that uses lifeguard stands as its skeletal frame, is back for its third run, taking place from February 20 to March 27. Along the boardwalk—stretching from Woodbine to Balmy beach—you’ll spot eight pieces selected from hundreds of local and international submissions. 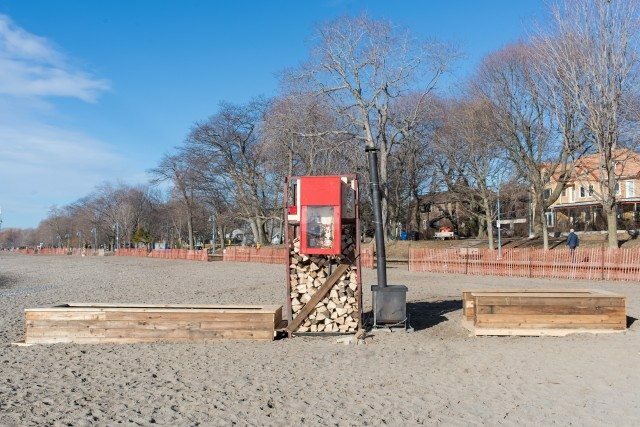 What started as fanciful sketches, the installations are now interactive works of art that turn the sandy expanse into a wintry playground. 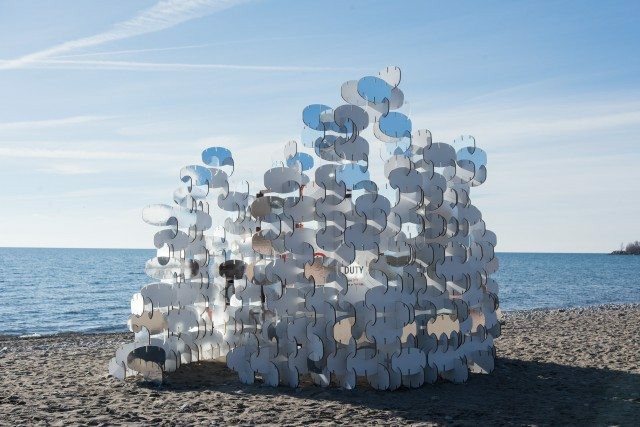 “BuoyBuoyBuoy,” among the winning designs from Toronto, is an assembly of interlocking “mirrors” in the shape of a buoy. The artists behind the wall of mirrors—Dionisios Vriniotis, Rob Shostak, Dakota Wares-Tani, and Julie Forand—want people to recall their childhood memories. “BuoyBuoyBuoy,” by a team of Toronto-based artists, is made up of hundreds of interlocking buoy-shaped pieces. The artists developed three separate designs for the hundreds of buoys that make up the piece. Most of the buoys are made of weather-treated wood, either painted in white or fixed with mirrored vinyl; others are milled from plexiglass, Shostak says. From afar and up close, the mass of buoys are supposed to create a “blurry form on the landscape”—acting as an imperfect, foggy representation of the memories we try to reconstruct. Whereas “BuoyBuoyBuoy” asks its audience to revel in the past, “I See You Ashiyu” wants people to soak up the present. “I See You Ashiyu,” by University of Toronto architectural students Asuka Kono and Rachel Palmela, adapts the Japanese design of a hot spring, or onsen, for the winter weather. You can dip your freezing toes into the cool warmth of the makeshift “hot spring”—what may be a relaxing treatment for winter-weary feet. Unlike natural hot springs, which draws its source of heat from nearby volcanic activity, the artists had to build a wood burning stove into their design to generate heat. “I See You Ashiyu” recreates the communal experience of steaming in a hot spring, with a view that overlooks the shore. “The concepts coming from onsen are physical warmth, relaxation, and interactions between people through water intervention,” says Kono in an email. “We become more open to others when we are warm and relaxed, without the barrier of clothing. More than an opportunity to beat the winter doldrums, there’s much to be learned about how we—and other cultures—perceive and enjoy winter. While the Kono and Palmela’s project didn’t directly stem from an exploration of the Japanese’s relationship to winter, it did spur them to think of how their culture engages with nature. For Shostak, “BuoyBuoyBuoy” is about bringing back a “childlike sense of play to winter” for adults who may have outgrown engaging in snowball fights, sledding down a daunting hill.